In cooking, espagnole sauce is one of Auguste Escoffier's five mother sauces that are the basis of sauce-making in classic French cooking. In the late 19th century, Escoffier codified the recipe, which is still followed today. Espagnole has a strong taste and is rarely used directly on food. 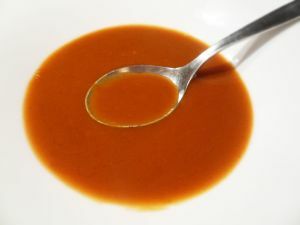 As a mother sauce, however, it serves as the starting point for many derivatives, such as Sauce Africaine, Sauce Bigarade, Sauce Bourguignonne, Sauce aux Champignons, Sauce charcutière, Sauce Chasseur, Sauce Chevreuil and Demi-glace. There are hundreds of other derivatives in the classical French repertoire. Escoffier included a recipe for a Lenten espagnole sauce, using fish stock and mushrooms in Le Guide culinaire but doubted its necessity. The basic method of making espagnole is to prepare a very dark brown roux, to which veal stock or water is added, along with browned bones, pieces of beef, vegetables, and various seasonings. This blend is allowed to slowly reduce while being frequently skimmed. The classical recipe calls for additional veal stock to be added as the liquid gradually reduces but today water is generally used instead. Tomato paste or pureed tomatoes are added towards the end of the process, and the sauce is further reduced.